Planalysis is an on-line interactive data visualisation tool specifically designed to assist the decision making efforts of property professionals. It can improve property and portfolio performance by unlocking of key data insights leading to more efficient processes, reduction of risk and identification of opportunities for growth. This innovative solution brings property and tenant metrics to life on a unique colour coded thematic floor plan that provides a spatial awareness not available from other systems or traditional reporting. Comprehensive graphing and charting capability presents information in a meaningful and easily understood manner enabling users to quickly identify trends and make more timely and informed decisions. Planalysis is accessible via the web and is designed to be integrated into your existing property management systems to effectively leverage available technology and information. Contact us today for more information or to organise a demonstration. Planalysis works with your current property management system, extracting required information and combining it with a specifically encoded floor plan or map to deliver rich and meaningful information that engages your Asset Managers, Property Managers, Leasing Executives, Marketing and Finance teams. 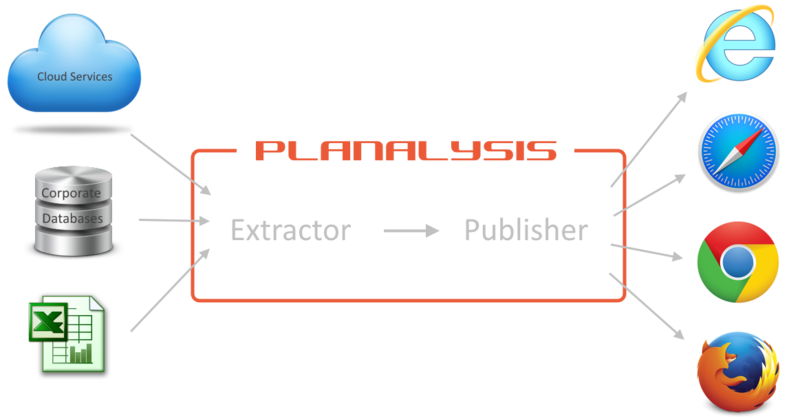 The Extractor draws information from a variety of data sources both inside and outside of your organisation. Our technology therefore leverages your existing system infrastructure to make installation simple and extremely cost effective. Key performance information is collected, aggregated and reformatted in a manner suitable for use by the Planalysis Publisher. The Publisher combines the extracted information with a specifically encoded floor plan to deliver an intuitive and responsive visualisations that enables you to discover opportunities and improve property and tenant performance. The robust and comprehensive set of charting tools allows users to easily visualise data, identify trends, and compare performance against peers and over time. Key Performance Indicators, pop up information, units of measure, plan colours and more are configured according to individual company requirements. Planalysis is accessible from all major web browser through a secure interface over the internet. The colour coded floor plan instantly updates according to the information being viewed providing a valuable spatial awareness. Various charting options enable you to view information and discover trends and relationships within your data. Built in collaboration functionality allows you to broadcast your screen enabling colleagues to discover and share your insights. Compare a tenant's performance against others in the centre and link to other models to compare performance of tenants and properties throughout the portfolio. Easily export your data, graphs or the floor plan for inclusion into your management reports. The simple and intuitive point and click interface makes it easy for everyone to use. Planalysis can be hosted in the cloud (Software-as-a-Service) eliminating the need for additional infrastructure or technical support to maintain the application. Increased productivity – by using a visual tool and collaboration capability to increase communication and data sharing, managers can monitor and analyse performance more efficiently. Improved process – the ability to graphically represent property and tenant information helps support more informed, quicker and effective decision making. More efficient management – having access to relevant and meaningful information about the performance of a property and its tenants makes it easy for users to access, monitor, analyse and understand what is happening. Accurate forecasting – having critical and historical information gives you the intelligence required to plan for future needs and requirements with confidence.